Scottsdale & Phoenix Bad Faith Attorneys | Claim Denied? We Can Help! Insurance companies thrive on denying claims and use every possible excuse to deny benefits. When they do not adhere to the terms of your insurance contract, or otherwise ignore or fail to reasonably consider your claim, they may be acting in bad faith. 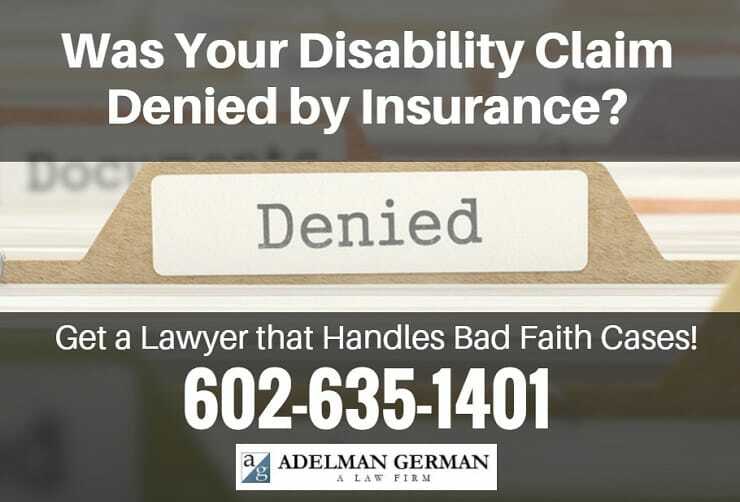 At Steve German, A Law Firm, in Scottsdale, we have a long track record of success in countering the bad faith practices of insurance companies and winning long-term disability benefits for our professional clients. Give us a call today at 480-607-9166 to get in touch with an experienced, Arizona long-term disability insurance attorney. This can be the first step in putting the pieces of your life back together. At Steve German, A Law Firm, we represent individuals in the medical profession, lawyers, accountants, dentists and specialists, as well as other high-level occupations from the bad faith practices of long-term disability insurance providers. Your insurance policy is a written contract between you and your insurance company, and it outlines the terms that both parties must live by. You have paid your expensive monthly insurance premiums and lived up to your end of the deal, and now your insurance provider must live up to its end of the deal by paying your disability benefits. Our attorneys have extensive experience handling long-term disability insurance claims. We are adept at identifying bad faith insurance practices and countering them on behalf of our clients. We will carefully examine the terms of your policy to determine if and to what extent your disability insurance company is not living up to its obligations or is otherwise violating laws governing insurance practices. Are you preparing to submit a claim for long-term disability insurance benefits, or have you received a wrongful claim denial? We are prepared to help. Please call our firm at 480-607-9166 to schedule a free initial consultation with an experienced long-term disability insurance lawyer. Or, if you prefer, complete our online form. Whether your benefits have been denied, or you are still preparing your initial claim, we can help you get the disability benefits you bargained for when times were better. We represent clients from all over the Phoenix metropolitan area, across Arizona and throughout the United States.